Calcium lactate has been shown to stimulate white blood cells to fight infection, fever, inflammation and sickness. Calcium lactate assists with wound-healing and repair of tissue, and is essential for everyday functions, such as heart rhythm, bone growth and cramp prevention. Calcium lactate and magnesium have beenused for cramping, regulating body temperature, nerves & more! Proprietary blend of Calcium Lactate, Magnesium Citrate, Organic Broccoli Florets* and leaf,* Organic Slippery Elm Bark*. Organic Potato Starch*, Organic Arrowroot*, Organic Marshmallow Root*, Organic Rice Extract*, Cellulose, Silica. Each Tablet Provides 250 mg Calcium Lactate, plus 60 mg Magnesium Citrate. 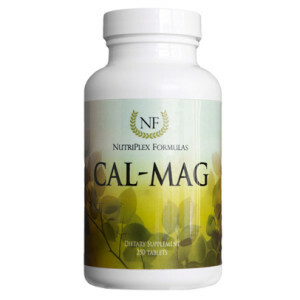 Cal-Mag contains Vitamin D in food form. Calcium lactate (in Cal-Mag), unlike other calcium products, is a source of ionized calcium, which is the least irritating form, and is best consumed on an empty stomach. NutriPlex Formulas’ calcium lactate is not made from milk. It is a white, odorless and nearly tasteless powder prepared by neutralization of lactic acid with calcium carbonate. A lower ratio of magnesium avoids canceling out the effects of calcium. Most calcium-magnesium products are in a ratio of 2 to 1, but this product, designed for biochemical support, is in a 4 to 1 ratio, which is close to the ratio that naturally occurs in blood levels. 4 tablets or 1/2 tsp. of powder daily, or as directed by a healthcare practitioner. Take on an empty stomach, at least half an hour before eating. Calcium deficiency may present itself in a wide variety of ways, including changes in body temperature, torn tissues, wounds, low energy, low-bone density, infection, insufficient white blood cell activity, nervous system problems, muscle cramping, cramping during menstrual cycle, cold sores and more.